History was made at Tynecastle this afternoon. Given the amount of times there is an Edinburgh derby these days you may question that statement. However, this afternoon saw the first ever Hearts-Hibs fixture to be played in the second flight of Scottish league football. After the fall out of relegation for both capital clubs, this summer has seen major changes at Tynecastle and Easter Road. Both clubs now have new managers, a sprinkling of new players and there is now a powerful and successful woman at the helm of both Edinburgh clubs. It was with this in mind that a full house packed Tynecastle Stadium for the first of at least four Edinburgh derbies this season. Hearts had something of a pre-match goalkeeping crisis with first choice keeper Neil Alexander ruled out for a month after fracturing his cheekbone in last week’s victory over Rangers at Ibrox and his understudy Scott Gallacher also being ruled out with an ankle injury. It was left to 20-year-old Jack Hamilton, whose loan to Stenhousemuir had to be curtailed due to the goalkeeping crisis, to make his competitive first-team debut for Hearts. It may have been a Sunday lunch-time kick-off but it was a typically fervent Edinburgh derby atmosphere at Tynecastle. Hibs supporters, despite their agonies of last season, nearly filled the Roseburn Stand and gave their team tremendous backing. The Hearts support responded in kind and the unfurling of a banner in the old main stand which red ‘Tick Tock Who’s Laughing Now’ was an obvious reference to those Hibs supporters who took great demise in their city rivals sinking into administration just over a year ago. The first half, it has to be said, was as far-removed from some of the free-flowing football on display at the World Cup in Brazil this summer as was possible. The midfield became a battleground with a stream of fouls and misplaced passes and one yearned for a playmaker to put their foot on the ball and calm things down. Sadly, this didn’t happen. There were few highlights of that opening 45 minutes. Michael Nelson headed just over for the visitors while Hearts Jason Holt delivered an inviting cross into the Hibs penalty box – unfortunately, no one was willing to accept the invitation. There was plenty of effort and determination from both sides but with half an hour gone neither goalkeeper had been called to make a save of any note. Then came the game’s first real chance. Hibs Daniel Handling raced into the Hearts penalty box with Hearts keeper Jack Hamilton racing to meet him. The Gorgie youngster brought him down and referee Willie Collum immediately pointed to the penalty spot. The Hearts players and fans alike were aghast when the official reached for a card but, thankfully for the home side, it was just a yellow and the goalkeeper remained on the pitch. Hibs’ Liam Craig stepped up to take the penalty kick but his effort went wide to the delight of the goading home support in the Gorgie Stand. Those supporters hoping Messrs Neilson and Stubbs might have offered few words of encouragement to their players to actually play football which was pleasing on the eye were somewhat disappointed when the second half quickly began to mirror the first – Hearts Jason Holt was fouled within six seconds of the re-start. Although the game was end-to-end there seemed little danger of the goal nets actually making contact with the ball – until the 76th minute and a most welcome display of skill and finishing. Hearts Sam Nicholson evaded a weak challenge before striding forward and unleashing a superb shot from 25 yards which flew into the net past a startled Oxley to give the home side the lead. Tynecastle erupted in a cacophony of noise from the home support as another derby win beckoned. However, Hearts never do things easily. Against ten men and with a two goal advantage, you might have expected the Maroons to comfortably see out the game. Not a bit of it. Hibs striker El Alagui almost pulled a goal back but his effort was brilliantly saved by young Hamilton in the Hearts goal. Moments later, Hearts were also reduced to ten men when striker Osman Sow was shown a red card for extensive use of his elbow. Having been thwarted minutes earlier, El Alagui did score for the visitors following a mistake from Hearts skipper Danny Wilson, the Hibs man heading past Hamilton. Hearts were then content to play out the four minutes of stoppage time and when referee Collum did eventually blow his whistle there was much relief from the home support. After the game, Hearts Head Coach Robbie Neilson was quick to praise youngster Jack Hamilton. "I had no issues about bringing Jack in. I worked with him last year," said the former youth coach. "He could have been man of the match today. It was an intense atmosphere. He handled it like a seasoned pro." Not the greatest Edinburgh derby you’ll ever see but Hearts won’t be complaining too much as they celebrate yet another victory over their rivals. Hearts: Hamilton, McHattie, Wilson, Ozturk, Gomis, Holt, Nicholson, King, Buaben, Sow, McGhee. Top man: Hearts Sam Nicholson – a wee gem in an afternoon which rarely sparkled. I took this on both my chins, of course. After all, Hearts supporters will never let their Hibernian counterparts forget what happened in the William Hill Scottish Cup Final of 2012. There were many Hibbies who saw Hearts relegation as justified comeuppance for the club living beyond its means, although it’s fair to say this could be applied to many clubs in Scotland, including Hibs themselves. However, as last season drew to its astonishing conclusion, it was evident the Easter Road club were hell-bent on self-destruction. They required just one win from their final few games to avoid the relegation play-offs. Even a point in their final game at home to Kilmarnock would have been enough. Of course, history will relate they didn’t get it. History will also relate that Hibs took a 2-0 first leg aggregate lead from their play-off against Hamilton Academical – but still succumbed to the Accies in their return leg at Easter Road and lost their top-flight status after a dramatic penalty shoot-out. There was, naturally, much ribbing from Hearts supporters to their city counterparts. However, some of my closest friends, including the fella who will be best man at my wedding next February, are Hibs fans and I genuinely felt for some of them and the devastation they undeniably experienced. Hibs demise against Hamilton Academical brought to mind Hearts notorious end of the season game against Kilmarnock at Tynecastle in April 1965. The Maroons were top of the league with the Ayrshire team in second place. The final game of the season between the two had been described as a ‘winner-takes-all’ but it wasn’t even that. Hearts just had to avoid a two goal loss at home to ensure the league title would be heading to Gorgie after a five year absence. Even a 1-0 defeat would see Hearts win the league on goal average as was the way of deciding such matters at that time. Both clubs now have new managers, a sprinkling of new players and there is now a powerful and successful woman at the helm of both Edinburgh clubs. When Hearts lost the league title in 1965, singer Bob Dylan released a single that still resonates in Edinburgh five decades later. For Hearts and Hibernian, ‘The Times They are a-Changin’. After a season when the club was traumatised by administration and suffered relegation from the SPFL Premiership as a consequence, Hearts ended their first competitive fixture of the new season with a comfortable victory over League Two side Annan Athletic in the first round of the Petrofac Training Cup at Tynecastle on Saturday. That Hearts are in this competition is directly because they are no longer in the top flight of Scottish football. Thus, they faced Annan Athletic for the first time and the outcome of the game was never seriously in doubt. Billy King was the tormentor in chief in the early stages and he opened the scoring after just eight minutes with a brilliant effort, dancing past a bewildered Annan defence before blasting the ball into the net beyond Annan keeper Mitchell. It was, as you might expect, mostly one-way traffic towards the Annan Athletic goal. However, the visitors did have a free-kick from Hopkirk which Hearts keeper Neil Alexander dealt with comfortably. After 20 minutes the home side were 2-0 ahead. Dale Carrick flicked a pass towards Osman Sow and the former Crystal Palace striker used his experience to outfox an Annan defender before slipping the ball beyond Mitchell from around 16 yards. Sam Nicholson was proving a handful for the visitors hard-pressed defence and the youngster had two efforts on goal, one which went just over the crossbar and the other which was directly at keeper Mitchell. The second half followed the same pattern as the first with Sow, King, Carrick, McHattie and Nicholson all having decent attempts on goal. Credit to Annan Athletic, though, who worked incredibly hard, particularly in defence, to keep the Hearts team at bay. There was only one more goal in the second half – but not at the end most people thought it would be. In the final minute Annan substitute Davidson scored with a fine finish which went beyond Neil Alexander from the edge of the box. Overall, it was another decent performance from Hearts and one can see the way Robbie Neilson wants his young team to play. Possession is the name of the game these days in Gorgie and the ethos seems to be if the opposition don’t have the ball then they can’t do you any damage. It’s certainly pleasing on the eye. With several new signings it’s going take a little while for this new-look Hearts team to gel but some of the football they played on Saturday and last Friday against Manchester City has been delightful. If I’m being picky I could say that Hearts need to be more ruthless in the opposition penalty box. It could and indeed should have been 6-1 to the Maroons today. And new recruit Alim Ozturk will need to be told that the Scottish Championship is not a league where he will be able to dwell too long on the ball! That aside, the early signs look promising for Hearts. Hearts: Alexander, Paterson, McHattie, Wilson, Ozturk, Gomis, Sow, Nicholson, King, Buaben, Carrick. Annan Athletic: Mitchell, Watson, Chisholm, McNiff, Black, Swinglehurst, McStay, Flynn, Todd, Hopkirk, Carcary. Top Man: Billy King. The youngster made a blistering start, then faded before coming back into the game again. A real prospect. Hearts today completed the formal signing of Osman Sow after the Swedish striker had appeared as a trialist in some of Hearts pre-seasons friendlies. The 6ft 4” former Crystal Palace player scored in Hearts 2-1 defeat from English champions Manchester City on Friday night and has impressed Head Coach Robbie Neilson. Neilson told the club’s official website he was delighted to have secured Sow’s services. ‘He’s a tall, athletic player who will provide a presence to our forward line. He was highly-rated at Crystal Palace so it’s a real coup to get him’ said Neilson who is rapidly constructing a new-look Hearts team. Sow also scored against East Fife in another friendly. Hearts have already signed Turkish Under 21 defender Alim Ozturk, former Hamilton Accies striker James Keatings, former Scotland goalkeeper Neil Alexander, ex Rangers goalkeeper Scott Gallacher, striker Soufian El Hassnaoui and former Dundee United midfielders Morgaro Gomis and Prince Buaben as they prepare to joust with Rangers and Hibernian for promotion back to the top flight of Scottish football. As pre-season friendlies go, Friday evening’s game between Hearts and FA Premiership holders Manchester City was a pretty decent effort. The glamour fixture, arranged to mark the centenary of the main stand at Tynecastle attracted a crowd of over 12,000 to Gorgie which was a pretty good turnout considering we’re in the middle of the holiday season. Hearts had Neil Alexander, Alim Ozturk, Morgaro Gomis, Prince Buaben and Osman Sow making their home debuts and all five players impressed, particularly Gomis who orchestrated things in midfield. The English champions weren’t quite at full strength - hardly surprising when you consider how many of the City squad were playing in the World Cup Finals in Brazil – but their starting eleven still included the likes of Samir Nasri, Alvaro Negredo, Micah Richards, Javi Garcia, Jesus Navas and Scott Sinclair, all of whom have considerable first-team experience. Hearts began the game in sprightly fashion with young Sam Nicholson looking particularly impressive. Sadly, the young winger had to leave the field after just 15 minutes with what looked like an ankle knock. He was replaced by Billy King. City had the first real opportunity when Nasri got to a cross from Navas but the former Arsenal playmaker’s effort was saved by Neil Alexander. Dale Carrick then had a chance for the home team after he was set up by Jamie Walker and it took a fine save from Wright to deny the young Jambo. City took the lead in the 24th minute. Fine play from the impressive Negredo set up Sinclair who buried the ball past Neil Alexander to give the visitors the lead – although there was more than a suspicion of offside in the build-up. The Manchester side, who were cheered on by around a thousand City fans in the Roseburn Stand, went in one goal ahead at the interval. City made several substitutions at the break but if Hearts thought things would get any easier they were soon changing their minds when they saw the likes of Kolarov, Fernando and Rodwell appear for the second half. Nonetheless, it was Hearts who scored a fine equaliser in the 55th minute. Great possession play by Dale Carrick set up newcomer Osman Sow and the big centre forward showed fine composure before easing the ball beyond Caballero. The goal was all the more impressive when you consider Sow had taken a knock just before this and his last action before going off was to score Hearts equaliser. The game looked like ending in a draw which would have been a fair result. However, with ten minutes left, Hearts right back Callum Paterson made a rash challenge on Huws inside the Hearts box to concede a penalty. Kolarov made no mistake with the spot kick and City held on to win 2-1. Considering the quality of the opposition, Hearts Head Coach Robbie Neilson can be pleased with his team’s showing. Even on this early evidence, it’s clear Hearts will be contenders for the Championship and promotion back to the Premiership. Hearts: Alexander (Hamilton, 70'), Paterson, McHattie, Wilson (McGhee, 75'), Ozturk (McKay, 70'), Gomis (Oliver, 75'), Walker (Holt, 56'), Buaben (Robinson, 59'), Sow (D. Smith, 56'), Carrick (Keatings, 56'), Nicholson (King, 16'). Manchester City: First half - Wright, Richards, Leigh, Nastasic, Rekik, Garcia, Zuculini, Sinclair, Nasri, Navas, Negredo. Second half - Caballero, Bossaerts (Clichy, 71'), Boyata, Kolarov, Denayer, Fernando, Rodwell, Sinclair, Huws, Jovertic, Guidetti. Top man: The highly impressive Morgaro Gomis. In the build up to this summer’s FIFA World Cup in Brazil, the BBC broadcast some official World Cup films from yesteryear. I didn’t watch the 1966 one, for obvious reasons, but I did catch some of the official stories of the 1970 and 1974 World Cups. Now those of you who have read my occasionally inane ramblings in these pages - and I thank you both – may well be thinking ‘here he goes again, football was so much better when it was played in black and white etc. etc.’ But bear with me on this. A good friend of mine – who is even older than I am – quite often bemoans the fact that the first aim of too many football teams these days is not to lose. He despairs at the cynicism in the game today, the diving, the harassment of the officials, and the lack of discipline. Old Charlie infers that the game was much more of a sport in days of old and that rampant commercialism and money-making has made football all the poorer. He might have a point but a look back half a century or more shows these traits are nothing new. The 1970 World Cup in Mexico is the first finals I can recall, being just 8 years old at the time. By this time, television was making its mark and these finals were the first to be transmitted by colour television. Brazil, of course, lifted the trophy for the third time by defeating Italy 4-1 in the final and this game, dominated by Brazilian superstars such as Pele and Jairzhinho, is seen as the benchmark to which all football sides should attain. However, as the official FIFA film shows, cynicism, negativity and indiscipline were rife even during the self-proclaimed golden era of football. The gifted Pele, arguably the best player the world has ever seen, was challenged by an Italian during the final and performed a dive which wouldn’t have been out of place in the pool for the Olympic Games held in the same country two years earlier. Pele fell to the ground clutching his ankle and appeared to be in agony. There seemed to be minimal contact, a suspicion enhanced moments later when Brazil scored and Pele bounded across the turf like a gazelle on heat. Earlier in the finals the Russian team, concerned by the effects of the baking heat at a midday kick-off, opted to put those squad members who weren’t playing to line up for the pre-match presentations to officials prior to the game against hosts Mexico. Thus, those players who were in action were spared the rather unnecessary long wait in the sun before kick-off. Then there was the game between the hosts and El Salvador. Mexico reacted to the apparent award of a free-kick to El Salvador by kicking the ball away. As El Salvador watched in bemusement, the referee did nothing, permitting the Mexicans to head up the park and score the opening goal. Rightly incensed, El Salvador hustled and bustled the Egyptian referee and even booted the ball out of play from the kick-off in protest. Mexico went on to win 4-0 and progressed to the quarter finals. Let’s face it, having the host nation in the knock-out stages would surely be preferable to having some no-hopers who were in their first ever World Cup finals…? You may think a lack of discipline is recent affliction to the game. Not so. Forty years ago, Scotland headed to the World Cup finals in what was then West Germany with high hopes. The Scots had qualified from a group which included Czechoslovakia and Denmark and were on their way to their first World Cup finals in 16 years. In the build-up to the tournament, Scotland defeated England - who had failed to qualify for the finals – 2-0 at Hampden and optimism was again a welcome visitor to Scotland. However, it’s ne’er do well pal, indiscipline, was never far away. Celtic winger Jimmy Johnstone got involved in an incident two days before the England game which saw him cast afloat on a dinghy with only one oar on the Firth of Clyde. Of course, ‘Jinky’ as he was affectionately known, had imbibed on one too many alcoholic refreshments. Scotland manager Willie Ormond was under pressure to drop Johnstone for such indiscipline but played him anyway – and the little winger proceeded to destroy the English with a masterful display. However, when Johnstone was involved in another incident during Scotland’s pre-World Cup friendly against Norway in Oslo – yet again, alcohol was the temptress – the S.F.A. chiefs made their feelings clear to manager Ormond. The result was that one of the best players this country has ever produced didn’t play in the World Cup finals even though he remained part of the squad. 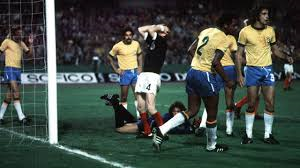 And the Scots went out on goal difference due to the fact they only defeated Zaire 2-0 – draws against reigning world champions Brazil and Yugoslavia weren’t enough. Thus, Scotland were the only undefeated team at the 1974 World Cup – champions West Germany lost a group game to rivals East Germany – but may have achieved so much more had the squad maintained their discipline. We can only dream of what Jimmy Johnstone would have done to Zaire had he been given the chance. The 2014 World Cup in Brazil was a splendid tournament. It produced more positives than negatives. Something not every World Cup finals - even those from the so-called ‘golden age’ – can claim…. Welcome to what I hope will become an on-going blog about football. As someone who is a keen historian - and who many people will tell you harks back to the old days of the terracings whilst wearing rose-tinted spectacles - the main content of this blog is likely to be a fond recollection of football from a by-gone age. Nonetheless, this won't prevent the odd comment or two about the state of the game today!